Tonality measured by Distance is a sound installation that explores natural resonant frequencies contained in small spaces, as well as the way sound changes its pitch when it reflects on a surface. It was originally inspired by the Helmholtz Resonators; the Helmholtz Resonators where invented in the 1860's by German physicist Heinrich Von Helmholtz. They where hollow spheres open on both ends, and where made in order to isolate and amplify the natural resonant frequencies contained in a space. Different sizes where used in order to isolate different frequencies. In this piece, small tie-clip microphones are placed in glasses in front of loudspeakers. 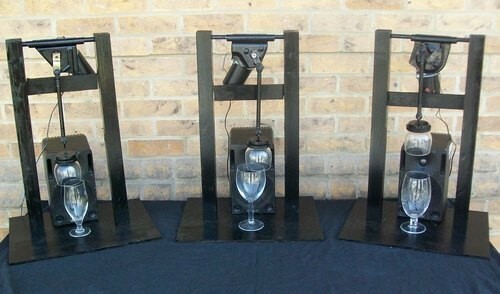 Candle-glasses are attached to windscreen wiper motors above them, rotating at a very slow speed. 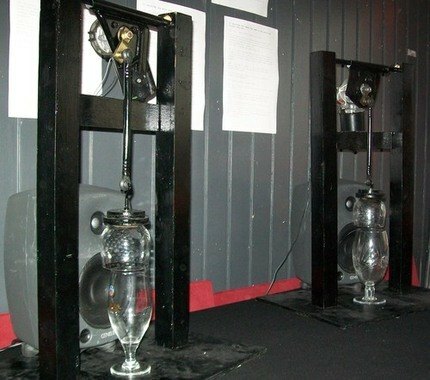 The candle-glasses and the glasses with the microphones inside them are acting together as one big resonator, where the feedback of the resonant frequency from the microphone to the speaker reflects. 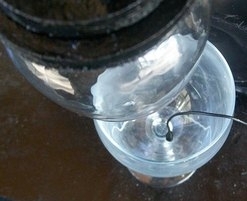 As the candle glassesare hovering above the glasses with the microphones inside them, the space in which the feedback reflects changes, affecting the pitch of the resulting tone.